PASADENA, TX -- Police say a 13-year-old teen was airlifted to the hospital after he was struck by a truck in Pasadena, and now authorities are searching for that driver. 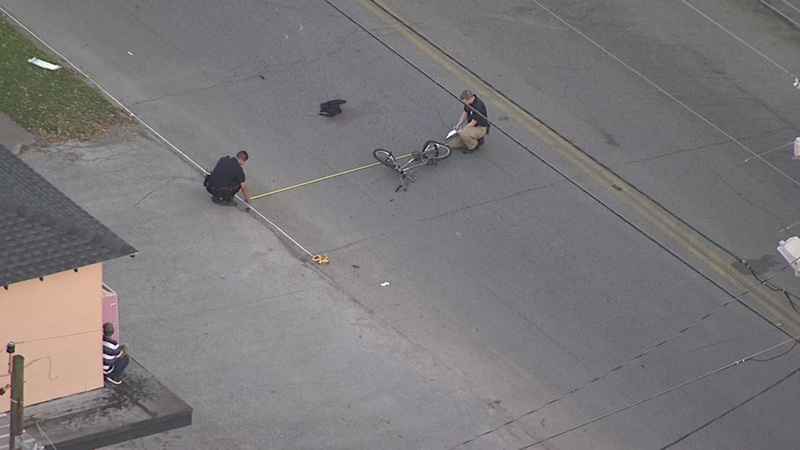 The accident happened as the teen rode his bike on Harris near Witter. The driver of the truck, a maroon Chevy Avalanche, fled the scene. Laura Cobb watched in horror. "The truck slowed down and stopped for a minute and then ran over them again," Cobb said. "They stopped for just a few seconds and then drove away," Pasadena Police Department Spokesman Vance Mitchell said. Cobb says the boy was in excruciating pain, helplessly screaming for his mother. "He was bleeding horribly. He said his arms were hurting," she said. "He had tire marks on his back." Investigators say camera at the intersection captured the incident and the driver who took off. They're now searching for that driver. Meanwhile, neighbors wishing the little boy well. "Our prayers are with them," Cobb said. The teen was transported via LifeFlight to Memorial Hermann Hospital, where he is listed in critical condition. However, we were told he was conscious at the scene and even gave authorities his home address so they could contact his parents.